Student Planner is a free app for Windows 8 and 8.1 which allows you to manage your school or college courses and assignments with ease on your device. The app allows you to add courses for which you can choose to add the assignments etc. to make the full use of the app. When you open the app, the app has a blank interface where you can choose to add courses via the control bar of the app. Then you can choose to add the assignments into the app by clicking on the course that you have just added into the app. 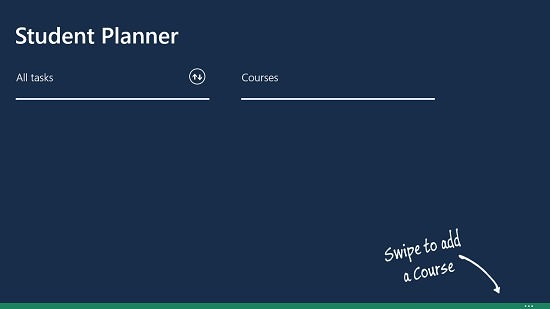 Student Planner is available for free from the Windows App Store. When you launch the Student Planner app on your device, you will be presented with the main screen of the app resembling the below interface. In the main screen, you can access the control bar by right clicking on the screen or by swiping up from the bottom of the screen. Once the control bars are visible on your screen, you can see the interface as shown below. 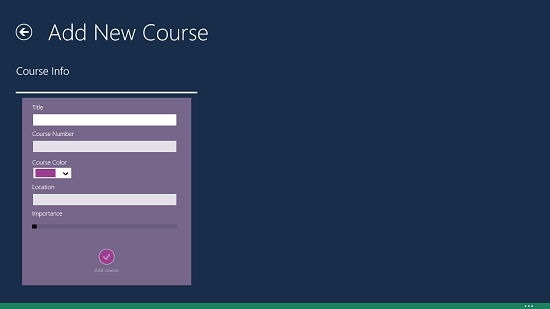 Now, all you have to do is to add a course by clicking on the Course button. Once you click on that, you will be presented with the screen where you can choose to add courses. This interface resembles the screenshot which is attached. Once you have added a course, you can set the priority for it. Now click on the Add Course button to make the course permanent in order for it to be available in the main screen of the app. You can see that I have added a course called Math in the screenshot below. You can now choose to add assignments, etc. to the course by clicking on the course tile, and then taking down notes by clicking on the buttons shown in the below screenshot. You can always return to the previous screen via the back arrow button at the top left. 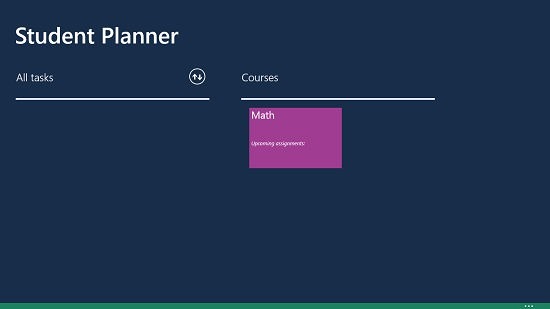 This concludes the feature set of the Student Planner app for Windows 8 and 8.1. Student Planner is a decent study planning app for Windows 8 and 8.1 which has a nice interface coupled with all the essential features which are needed from a planning app. Overall, the app is truly capable of a 5 out of 5 rating!